Caroline Bagga, Founder of Mother Nurture Yoga, Sydney’s Leading Pregnancy Yoga School, talks about the importance of staying active during pregnancy and the many benefits of Pregnancy Yoga. We all know that a healthy lifestyle is important. When you are pregnant, your baby is completely relying on you so it’s even more important to stay active and have a healthy pregnancy – physically and emotionally. The experts all agree: The American College of Obstetricians and Gynaecologists, The Royal College of Obstetricians and Gynaecologists in the UK and The Australasian College of Sports Medicine all say that moderate-intensity exercise is important for pregnant women. Many women turn to yoga when they are pregnant, and for good reason. It is the best all-round form of exercise and the one recommended by many Midwives and Doctors. When practised correctly it is safe and beneficial for both mum and baby. Feel more energetic. Growing a baby is tiring, especially in the first and third trimesters. Yoga will help to restore your energy. Relax, reduce stress and anxiety. According to experts, everything the pregnant mother feels and thinks is communicated through neurohormones to her unborn child, just as surely as are alcohol and nicotine. So relaxation, positive thinking and connection can nurture a healthier and happier child during pregnancy. Yoga is highly effective in endorphin production, which lifts your mood and makes you feel great. Sleep better. Indigestion, insomnia and hip pain are common in pregnancy and prevent you from getting the rest you need. Yoga can help with all these conditions. Maintain a healthy weight. Obesity and Gestational Diabetes are both common issues these days. A healthy diet is critical but a regular yoga practice will also help you maintain a healthy weight. Build strength. The average weight gain in pregnancy is between 12-15kg – that’s a lot of extra weight you have to carry around! Yoga poses strengthen the legs and core so you can carry your growing baby with ease. Correct posture to reduce aches and pains. Poor posture combined with additional weight puts pressure on the ligaments of the abdomen, back, hips and pelvis, which results in back ache, pubic pain, headaches and tension. A shifting centre of gravity contributes to lumbar lordosis (an exaggerated curve in the lower back), which is responsible for back pain in 40 – 50% of pregnant women. Yoga will stretch and strengthen the supporting muscles and teach you correct posture. Many of our clients report improvements in back pain after just 1 or 2 classes. Feel prepared and confident for an empowering birth. 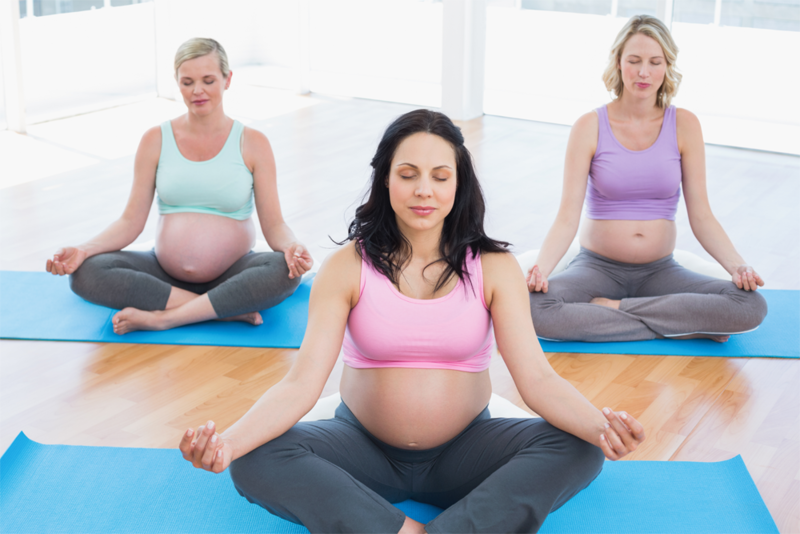 Prenatal yoga classes teach you breathing techniques and positions for active birth, giving you practical tools and building your confidence ready for the birth of your baby. If you’re hoping for a natural delivery it’s really good to not just know what these tools are, but to also practice them on a weekly basis so you become really familiar with them. Build your pelvic floor muscles. Pregnancy and birth places your pelvic floor muscles under enormous strain. During a yoga class particular poses help you to become familiar with your pelvic floor so you can learn how to activate these muscles correctly – and importantly learn how to relax them for giving birth. Get back into shape more easily after giving birth. Keeping active during your pregnancy will make it easier to bounce back after giving birth. Start bonding with your baby. A yoga class gives you special time to turn your attention inwards, learning to listen to and connect with your baby. Guided visualisations and touching your bump are an important part of prenatal yoga. Connect with other pregnant women. It’s lovely to be able to share this special journey into motherhood with other women from your local area. There is often time to chat with the other ladies before or after the class to share your experiences, tips and form new friendships. Being a new mum can be isolating so these friendships are important. So what exactly happens in a pregnancy yoga class? A typical Mother Nurture Yoga class includes meditation, pranayam (breathing techniques), asana (yoga poses), and relaxation. It’s a great combination of getting a gentle work out, relaxing and preparing for labour and birth. Perhaps you did some yoga a long time ago, or you’re a complete beginner and feel nervous about joining a class because you’re a beginner, not very flexible, or you’re not sure what to expect. Don’t worry, you’re not alone! In fact many women try our classes for the first time when they are pregnant. Going to a specific pregnancy yoga class like the ones offered by Mother Nurture Yoga is essential as a general yoga class is not tailored for pregnant women. You’ll find pregnancy yoga is gentle, suitable for beginners and all stages of pregnancy. “When is it safe to start?” is one of the most common questions. Some ladies choose to wait until after the 12-week scan, while others are happy to start earlier – it’s a really personal decision. But the sooner the better before your bump gets too big! If in doubt, discuss your specific circumstances with your healthcare provider.